Here are some from this year! We spent some time with both of our families and ate too much. We are THANKFUL for everyone we ate with and shared time with on Thursday! Yes, Mom Guilt. I don't know how to explain it, but I think it's a new mom thing. I've talked to others about it; I hear it goes away at the second child. I feel like most mom's just get it when I say Mom Guilt, am I right? Because I don't know how to explain it. In a broad sense, it's as if I always have Bella on my mind, what Bella is doing, and wondering if I'm making the right decisions for her. I think mine, like many, comes from trying to be "super mom", and it's impossible. Meaning, we can be the best we can be - but you can't compare yourselves to every other mom or every thing you read. For the most part, I'm done with Mom Guilt now that she's not a tiny baby. But I still have to remind myself sometimes to relax and enjoy the moment! Does this make sense? Do you have/had mom guilt? 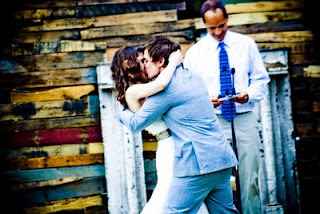 Her first wedding was the rockin' wedding of the Giessen's! Our friend Josh got married this weekend. It was Bella's first time attending a wedding. So, after about 3 minutes, that equaled Bella out of the sanctuary and crawling around the halls of the church while the wedding went on. She doesn't sit still very often these days. Chris has been struggling with a terrible cold/flu. He's back at work today and feeling better though! I am glad Bella got the flu shot and we are happy Dad is back to normal. These pictures are from a couple of weeks ago. Aubrey is exactly one month younger than Bella. We celebrated her birthday with her and some of her other small group friends! Isn't she adorable? Bella is fun, sweet, beautiful and a lovable baby/ little person. I love to take care of her, love on her and most - LAUGH and have fun with her! I LOVE love the days that I can rock her to sleep (most of the time now she's just like - "Put me in bed!") I love the "ma-ma-ma-ma" - gets me every time! She loves me she needs me. It makes me feel purposeful and loved that this little girl would love me like I love her. 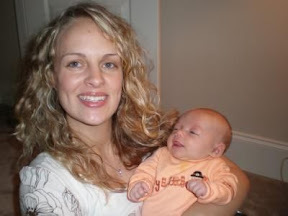 I think overall, on top of all the other bonuses of being a mom, that's the thing I love best in this moment of time. Any other questions you want to add to the post below? I've been tagged, a long time ago, by a few friends... and now I don't remember if it's 5 or 7 things random facts? 1) I have serious mom-brain. It's bad, people. 2) Biggest pet peeve: People putting objects, or hands, in my face. 3) I will do laundry all day. Well, no ironing. But can someone clean my shower? And.... I'm stuck. Why don't we turn this into "Ask Katie a question and give her something to blog about?" Ask and I'll answer... be creative as you want. So, between the moonwalk and air mattresses... I think she loves to bounce. I didn't get a good video of her on her birthday on the moonwalk... but she was squealing for a good while just like this clip from a couple of weeks ago on the air mattress. And don't worry, she didn't hurt herself! That's Uncle Brian in the background. Friday, Chelsie spent the night and we've had the air mattress out since. Makes a great toy! She likes being in there, having us shut the doors, and then to pop out! Breakfast, bottle, Baby Einstein and PLAY! And then, the whole family does the "hot diggity dog" dance at the end of the Mickey Mouse Club. I like Minnie's dance; Chris is Goofy. Do yall know what I'm talking about? It's so funny! Northpoint Ministries had their annual "Fall at the Farm" on Thursday. It was great - Bella was able to see, touch and sit on a pony! 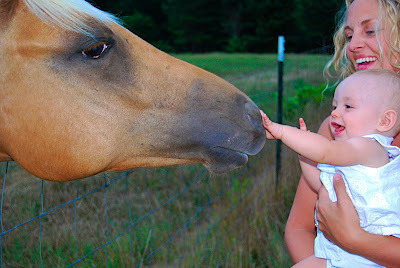 (she loved her first horse sighting,loved if you remember!) We ate BBQ, had some funnel cakes, jumped on the moonwalk and visited with co-workers and friends. Oh, and who can forget, riding on Daddy's shoulders is THE BEST! Bella got some fun gifts for her birthday. This one has been a winner. This video is her doing some random stuff and being funny as usual. Visiting Chelsie and Yellow Sauce! Monday I didn't have any plans in place. Bella didn't want to take her first nap. So I made a spontaneous decision to go visit my sister! On the way I called my mom and she jumped in the car with me in Lawrenceville. We ate at my favorite place in Athens, Inoko! YUM yellow sauce! Bella enjoyed it as well. 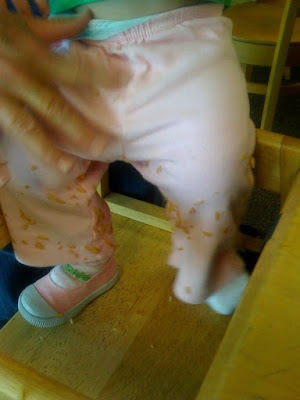 I think she did anyhow - more of the rice ended up stuck on her pants and floor than she ate! 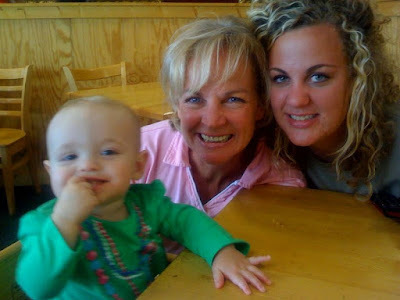 Check out my mom's blog for even more pics from the day! 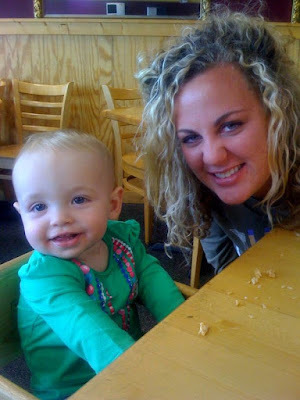 It was a quick trip but we enjoyed seeing Aunt Chelsie! This is one of Bella's favorite phrases. It's great - she says it when she drops things and when she pulls my hair! This also works out because Mom makes lots of "uh-oh's". This past Gameday, Chris and I hung out with some neighbors. I had never been in their house, and they had a few other friends over - none of which we had ever met. First, Bella, Chris and I walk in ALL decked out in UGA gear. Bella looked cute as ever in a warm up that GG bought her. Chris had on his Red & Black, and I was sporting a Knowshon Jersey. We looked serious. We walk in and no one else was really even in the school colors. Not that it matters... but you know, first impressions - I was thinking "where's the school spirit" and they were probably thinking we were fanatics. Thanks for letting me set the scene. So, I have worn this jersey a few times this season now. Since it is now fall, I wore a long sleeve shirt underneath. Half way through the game, it got hot. Maybe because we were getting killed by FL, or because I was chasing Bella while trying to eat a hot dog or maybe because it was just November in GEORGIA! Either way, I was pretty quick to take off that long sleeve shirt once I started to break a sweat. Anyhow, about an hour later, I realize - I have a jersey on!!! You can see right through the stupid thing!! No one knew me well enough to say anything. Nice. So, I ran to put the shirt back on. When uploading these pictures, I got a nice laugh - you can see my nice pink bra and tummy sticking nicely over my jeans. Don't worry, the pictures have been cropped or deleted altogether. "Uh-oh!" We moved Bella into her big girl car seat and she now faces forward with us. We love it!!!! She is so much fun. Also, Bella took her first steps on Friday night! She isn't "walking" around by herself all the time yet, but we can say that she took her first steps that night! She was practicing between Chris and I and we were pumped!!! Halloween night, we hung out at the house. 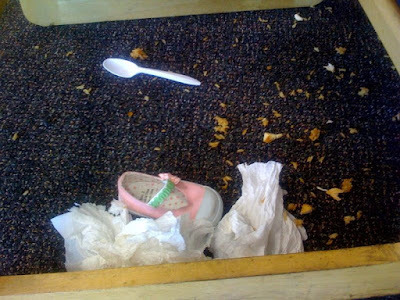 The Masterson's brought their little Sweet Pea, Josie, over and the girls had a slumber party. The Walker's came by and look at their costume!!! 1) Bella in her pumpkin costume... she couldn't crawl in it, so she wasn't having it. 2) How short Bobby's shorts really were. 3) The amount of candy we have left over, and are now eating, because our porch light was burnt out and only had 10 trick-or-treater's.